From the #1 New York Times bestselling author of The Da Vinci Code, Angels & Demons, and Inferno—now a major film directed by Ron Howard and starring Tom Hanks and Felicity Jones—comes a lightning-fast thriller about an astonishing NASA discovery that uncovers a vicious conspiracy leading all the way to the White House. When a new NASA satellite spots evidence of an astonishingly rare object buried deep in the Arctic ice, the floundering space agency proclaims a much-needed victory...a victory that has profound implications for US space policy and the impending presidential election. With the Oval Office in the balance, the President dispatches White House Intelligence analyst Rachel Sexton to the Milne Ice Shelf to verify the authenticity of the find. Accompanied by a team of experts, including the charismatic academic Michael Tolland, Rachel uncovers the unthinkable: evidence of scientific trickery—a bold deception that threatens to plunge the world into controversy. In his most thrilling novel to date, bestselling author Dan Brown transports readers from the ultrasecret National Reconnaissance Office to the towering ice shelves of the Arctic Circle, and back again to the hallways of power inside the West Wing. 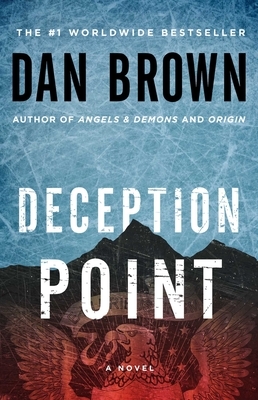 Heralded for masterfully intermingling science, history, and politics in his critically acclaimed thriller Angels & Demons, Brown has crafted another novel in which nothing is as it seems—and behind every corner is a stunning surprise. Deception Point is pulse-pounding fiction at its best.